Battle rope is great for full-body exercise that focuses on muscular building and cardiovascular enhancing. It is constructed with 3-strand nylon and easy to begin working--just wrap it around something (tree, post, pole) and then get it start. How to Choose the Right Rope? 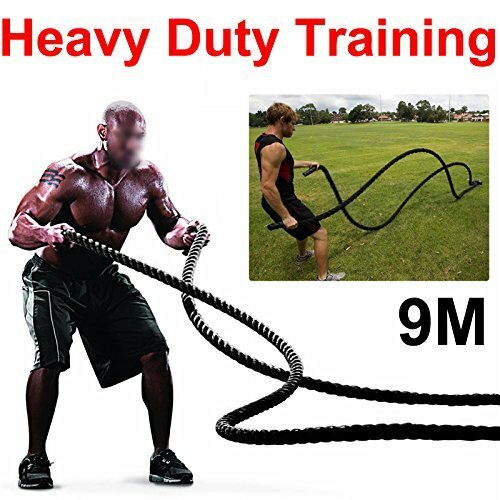 The diameter of rope affects how difficult it is to grip, so 1.5'' rope diameter is good for general fitness, while 2'' for those who want very tough grip workout. The length of rope affects how difficult it is to move, as the heavier the rope is, the more difficult it is to get start: 30' suits for beginners, and 50' is the most common length in cross-training gym. 2. Get the rope away from hard hooks or metal debris.